Upper Cross Syndrome is characterized by rounded shoulders with an anteriorly tipped shoulder blade (scapular) and forward poking chin. Dr Vladimir Janda, a Czech Physician and Physiatrist was the first to identify the common muscle imbalance denoted the upper cross syndrome. Complaints of people with upper crossed syndrome are typically stiffness in the neck, headaches, tension and soreness along the slope of the shoulder, front of shoulder, and tight, sore, upper back. Upper crossed may also result in neurological problems (from tingling or pins and needles to shooting pain and numbness) extending into the arms, hands, and fingers. 1. The screen is right in front of your eyes. No poking chin or facing downwards. 2. The keyboard should be at a level such that your elbows are bent at 90 degrees shoulders slightly back and wrist remain in neutral position with feet well supported on the ground and back erect. To stretch the left levator scapula, reach onto the top left side of your head with your right arm and use this to aid the stretch as you look across and down. The stretch should be gently felt through the neck and levator scapula at which point hold your position for 10-15 seconds making sure to continue with deep calm breaths. Release the stretch and relax before repeating two or three times. To make the stretch deeper, place your left arm behind your back. Sit straight up in a chair with your shoulders relaxed. Bring your chin down toward your right collar bone as far as you can without rounding your upper back. Then turn your head slightly to the left. 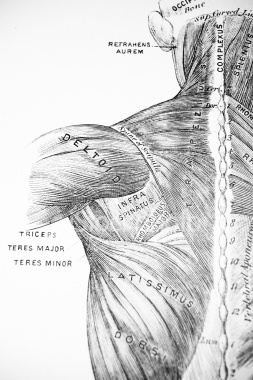 You should feel a pulling sensation in the left side of the neck. Hold this position for 20 seconds. Rest 15 seconds and repeat again twice on that side. Then perform the stretch on the opposite side three times. These are great for lengthening tight pectoral muscules. Placing one or both arms along the door way and slightly stepping forward will apply some pressure to the muscles. Be sure not to step too far forward and strain your low back by over extending it. Lay over a foam roller with your hands under your head. Bridge up off of the floor and roll back and forth over your upper thoracic kyphosis. Repeat for 1 minute. 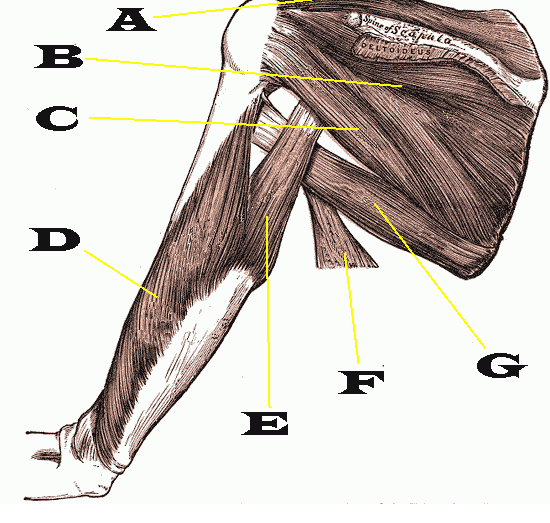 Bring your shoulder blades (scapulae) down toward the ground and back. The idea is to squeeze them together so you could pinch a pencil between them. 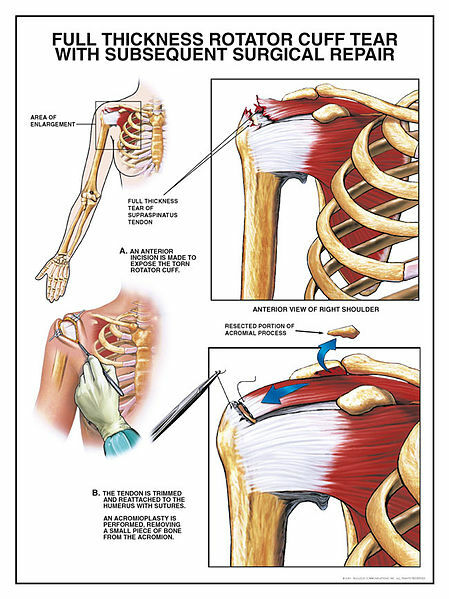 This activates the Rhomboids and lengthens the pectoral muscles. This is an easy stretch to do at your desk. This stretch will activate the muscles required to maintain proper head position. Sit up straight, now move your head slightly straight backwards creating the "double chin" effect. This will help combat the forward head carriage that many people suffer from. Stand up from your desk, open your hands up and rotate your thumbs backwards. 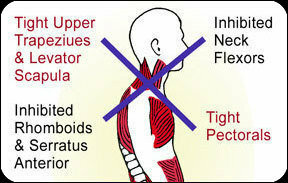 This will relax your upper traps and allow the shoulder blades to slide down and back to your back pockets. Take a deep breath in through the nose and slowly let it out through the mouth. Repeat 2 times. Upper crossed syndrome and its relationship to cervicogenic headache. J Manipulative Physiol Ther. 2004 Jul-Aug;27(6):414-20.